Draw attention to your aspiring look with our chic women’s cuffed faux suede booties. These booties are constructed from a water resistant faux suede that is 100% cruelty-free. They feature a foldable knit shaft that provides an attractive cuff at the ankle. These booties are an easy slip on style that is devoid of snaps, zippers or buckles. 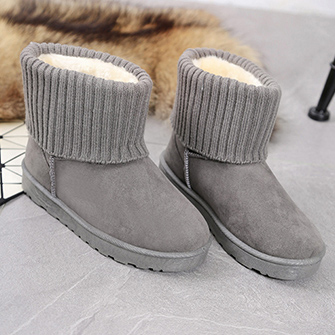 They are fully lined with a cozy faux shearling lining that wicks moisture, as it provides a soft cushion that makes walking a comfortable pleasure. They also have a foam-cushioned insole. The rubber outsole is heavily treaded to help you avoid slips and falls on the ice and snow. These high quality, imported booties were created in a classic style that never goes out of fashion. They are ankle high, and come in your choice of buff or medium gray. 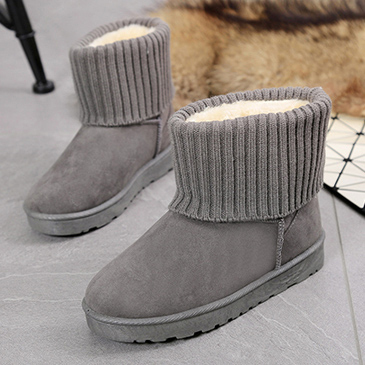 Try these women’s cuffed faux suede booties with all of your favorite winter slacks and skirts.